During timed writing assignments in the average class, students write their essays while instructors enforce a culture of quiet. Students are actively discouraged from talking to each other, and even conversations relevant to the task at hand, such as one student asking another how to spell a word, execute an idiomatic phrase, or provide the translation of a word or expression into English from their shared native language, are effectively discouraged. Time is called, students turn in their essays to be critiqued by their instructors. Once graded, the essays are returned to students for review and, possibly, error analysis and revision. While the above scenario may be the norm, it would behoove teachers to challenge the widely held belief that the writing process is an individual and quietly contemplative act. Despite the fact that many ESL writing instructors engage students in a collaborative peer and revision review process after students have written an initial draft of an essay, very few instructors make interaction and collaboration an integral part of the writing process from its inception. However, there is much to be gained from forging deeper connections, during the writing process, among speaking, metacognition, and writing. A growing body of theoretical and empirical research suggests that utilizing social interaction between ESL students while they write supports their mastery of the multifarious cognitive skills needed for academic writing (e.g., Atkinson, 2003; Weissberg, 2006). The research also indicates that social interaction while writing helps learners develop metacognitive knowledge that can positively influence both their writing and their academic ability (Angelova, 2001; Kasper, 1997; Ruttle, 2004). Following are some activities that will enable teachers to restage a timed writing activity so that students can integrate speaking and writing during the three main stages of the writing process: prewriting, active writing, and postwriting. Students choose the essay topic that they want to write about from a list of two to four writing prompts. Students who have selected different topics are paired together. If possible, try to pair students with different linguistic/cultural backgrounds. Once paired, students conduct 7-minute interviews with each other to elicit their partner’s intentions in addressing his or her selected essay topic. This encourages a think-aloud process in which students deliberately address how and what they will communicate about their chosen essay topics. During the paired interviews, the interviewer uses open-ended questions and takes notes to record his or her partner’s responses. After conducting the interviews, each partner recaps the comments his or her partner made and provides the partner with a copy of the notes. Students can use their partner’s notes to plan their writing. This builds both speaking and writing skills through sharing and reinforced learning. Students begin writing their essays in a quiet environment. At periodic intervals (every 15–20 minutes for a 75 minute class session), the instructor calls a 3 minute break. During the break, students can read their essays out loud (to themselves or to their partners), and they can meet briefly with their partners to discuss and get feedback or assistance. Students resume writing after each break. The essays are returned to the students with your feedback, as well as an unrecorded grade on a Post-it note, which the students can remove before sharing their essays with their partners. Each student shares his or her essay with his or her partner from the previous class session. They build off of your guidance while also generating questions for classroom discussion. Additionally, this provides you with valuable feedback on the students’ progress to help you move forward in the lesson planning. Provide students with a list of guidelines (see example below). Using this list, students engage in a dialogue with their partners about their essays. Students are encouraged to take notes on their partners’ comments and suggestions for improving their writing. Students revise their essays for a homework grade. What is especially interesting, effective, or creative about how your partner chose to respond to the essay topic? What seems to be the main idea or purpose of this essay? Who do you think your partner’s intended audience is for this essay? How well does the draft seem to address this intended audience? Any suggestions for improvement? Comment on the introduction of the essay. Did the first sentence grab your attention? Is there a thesis statement? Is the thesis statement clear and effective? Suggestions? Comment on the organization of the body of the draft. Does the body of the essay address the thesis? Suggestions? Are there places in the body of the essay that need additional details or examples? Do transitional devices or phrases improve the flow of ideas in this essay? Suggestions? Comment on the conclusion of the draft. Has the thesis statement been restated in the conclusion? Suggestions? What does your partner think are the strengths and weaknesses of this essay? Do you agree/disagree? Comment on your partner’s evaluation of his/her essay. What have you learned about writing from reviewing the first draft of your partner’s and your own essay? When students write out loud they learn not only that writing is a meaning-making process, but they also learn that they, as writers, can make deliberate choices about how they express their thoughts and ideas through writing. Best of all, when teachers encourage their students to integrate speaking and writing, teachers free their students from the false constraint of writing in a linguistic vacuum. Successful writing, it turns out, can be a loud, engaging, communal experience. Angelova, M. (2001). Metacognitive knowledge in EFL writing. Academic Exchange Quarterly, 5(3), 78–83. Atkinson, D. (2003). L2 writing in the post-process era: Introduction. Journal of Second Language Writing, 12, 3–15. Kasper, L. F. (1997). Assessing the metacognitive growth of ESL student writers. TESL-EJ, 3(1). Retrieved from http://www.cc.kyoto-su.ac.jp/information/tesl-ej/ej09/a1.html. Weissberg, R. (2006). Connecting speaking and writing in second language instruction. Ann Arbor, MI: University of Michigan Press. Jessie Hayden is an ESL instructor at Georgia Perimeter College in Atlanta, Georgia. She earned her MS in Applied Linguistics/Teaching English as a Second Language from Georgia State University. During her career, she has served adult learners in ESL literacy programs and in higher education settings both in the United States and in the Middle East. She has three passions: teaching ESL writing, riding horses, and gardening organically. TESOL’s web content and social media manager. Congratulations to Leigh Lawrence, of Lithia Springs, Georgia, USA, for being the winner of the October 2012 TESOL Connections Monthly Giveaway. Leigh won a free set of TESOL technology books. TESOL Quarterly is a refereed professional journal that fosters inquiry into English language teaching and learning by providing a forum for TESOL professionals to share their research findings and explore ideas and relationships in the field. TESOL Blogs need your expertise! Have a great idea for the classroom? Contact Craig Triplett or Tomiko Breland with your idea or for details. Authors Diane Staehr Fenner and Natalie Kuhlman bring their extensive knowledge of the Standards and offer step-by-step applications using the five domains of Language, Culture, Instruction, Assessment, and Professionalism. Readers find new directions, ideas, and ways of thinking about how programs prepare teachers who teach English language learners in the United States as well as around the world. "As we raise the bar for our P–12 students, we must also do so for the programs that prepare our teachers. I congratulate TESOL on this timely and practical volume." ". . . 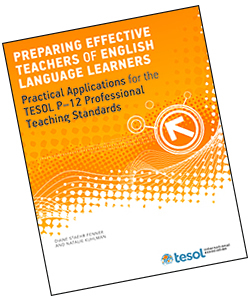 Most important, this book provides a framework for professional development programs that is built on the TESOL P–12 Professional Teaching Standards that will benefit ESL as well as content-area teachers."